Definition - What does Padangustasana mean? Padangustasana is a balancing yoga asana that requires a considerable amount of both strength and flexibility to support the body on the ball of one foot. As well as a range of physical benefits for the lower body, it can be used to improve balance, calm and equanimity. Padangustasana's name comes from Sanskrit and can be literally translated as “big toe pose.” It is so called because of emphasis on the standing toe. Padangustasana may also be known simply as toe stand. As well as physical balance, this version of padangustasana is thought to help create a clear and balanced mind. The challenging nature of it means it needs to be practised with calm focus and discipline in order to achieve the posture with grace and maintain a relaxed mind. 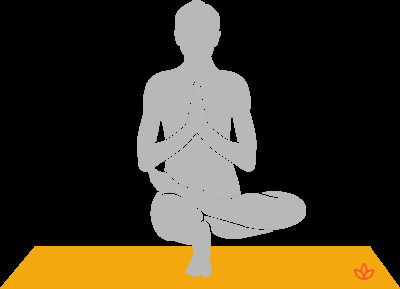 The eyes can be closed during the balance to maintain the pose without any reference to the external world. This is more challenging. Padangustasana, in Bikram yoga, refers to the toe stand posture described and pictured. It may also be a popular posture in challenging Vinyasa yoga classes. However, it should not be confused with the posture in Ashtanga Vinyasa yoga which is also called Padangusthasana, but refers to a standing forward fold holding the big toes.